It’s always fun to find a “new” way of serving a classic in a hundred-year-old cookbook. I recently was browsing through an old cookbook and found a recipe for Green Peppers Stuffed with Fish. Of course, I had to give it a try. Preheat oven to 350 degrees. Cut thin slice from stem end of each pepper. Remove all seeds and membranes. Wash inside and out. Put peppers in a large sauce pan; cover with water. Bring to a boil. Cook peppers for 5 minutes; drain. In meantime, melt 1 1/2 tablespoons butter in a saucepan. Stir flour, salt, pepper, and Worcestershire sauce into melted butter. Slowly pour in milk and bring to a boil over medium heat while stirring constantly. Place a small amount (approximately 1 – 2 tablespoons) of the hot white sauce mixture into dish with beaten egg, stir quickly. Then add egg mixture to the remaining white sauce, and cook for two minutes using medium heat. Stir in the flaked fish and continue cooking until the mixture is hot. Lightly stuff each pepper with the fish mixture. Stand peppers upright in ungreased baking dish. Top the fish mixture with bread crumbs and small dabs of butter. Cook until the bread crumbs are lightly browned and the stuffing is very hot (20-30 minutes). Posted on September 17, 2017 September 16, 2017 by SherylPosted in FoodTagged fish, green peppers, recipe. Next Next post: Are Salted Nuts More Digestible Than Unsalted Ones? It’s a very nice combination. That sounds delicious. I never would have thought to mix fish with peppers like this! Never in my life would I have thought to stuff peppers with fish. Now I’m thinking: what about shrimp — especially shrimp done up with onion and celery? With the bell pepper to complete the “Cajun trinity,” and some Cajun spices, it would be a fabulous dish. It sounds good to me, too. As soon as I can put my hands on some fresh shrimp, I’ll make it. Right now shrimp are a little hard to come by because of all the fresh water in the bays. Wherever they’ve gone, they aren’t here. But they’ll be back, probably sooner rather than later. If you like fish, I think that you’d like this recipe. One thing that I enjoy about old recipes is that sometimes they combine ingredients (or use processes) that work well, but that are different from what is found in modern cookbooks. It’s always wonderful to hear when I post a recipe that you think sounds good enough to forward. Wow, it’s amazing how long ago they starting making Worcestershire sauce. I never should have guessed that it’s been around for the better part of two centuries. Oh my. 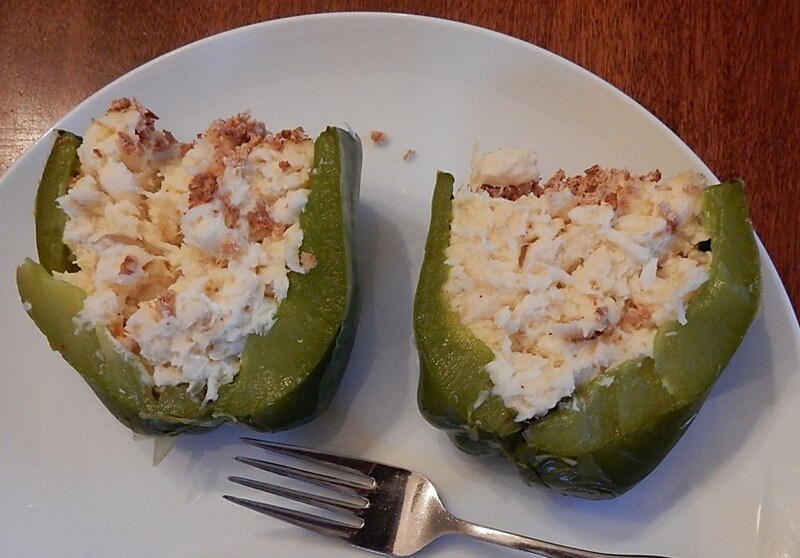 I like stuffed peppers but stuffed peppers with fish are something I’m not too sure about. I suspect I’d have a hard time getting the family to try it too. . .
What a curious combo. I’m glad it turned out tasty. I think that I may have previously had slices of sauted peppers served on top of a piece of fish, but if I hadn’t seen this recipe I never would have thought of stuffing a green pepper with fish. 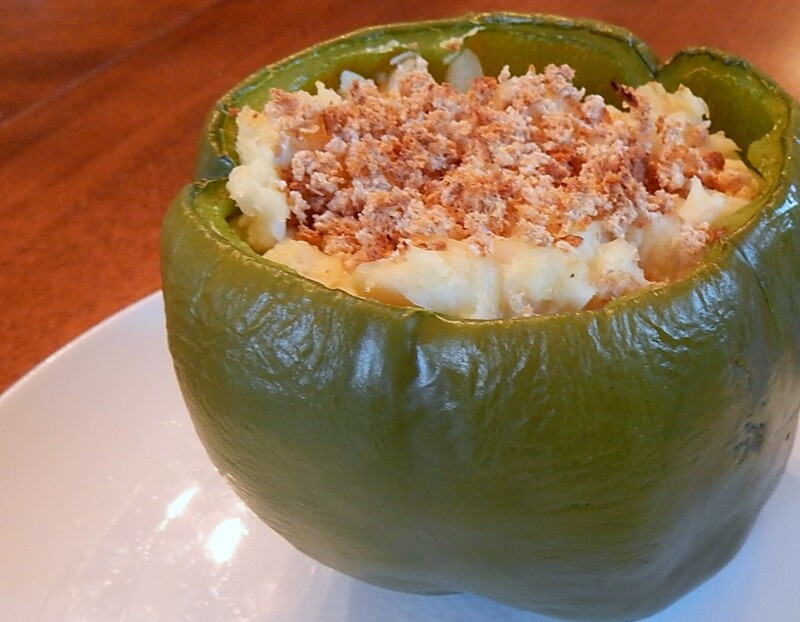 I love stuffed peppers but I’ve never tried stuffing them with fish. Can I use some other kind of fish, like mackerel? The old recipe called for “halibut or other white fish.” I don’t think that mackerel is considered a white fish, but it still might be good. Oh, that’s an interesting combination, sounds pretty good, too! The green pepper and fish work well together. Sounds good and it has to be healthy, too! I’m thinking about trying it with tilapia. I remember my grandmother growing green peppers and they were about half the size of what we buy in the grocery stores now. I think that tilapia would work well in this recipe. I also have vague memories of green peppers being much smaller years ago. These days it seems like even the green peppers sold at farmers’ markets are huge. That is an interesting combo. I make stuffed bell peppers with chicken, corn, black beans, cheese, and sometimes tomatoes and cilantro. I would never have thought to use fish! Mmm. . . the ingredients you use when stuffing peppers sound wonderful.